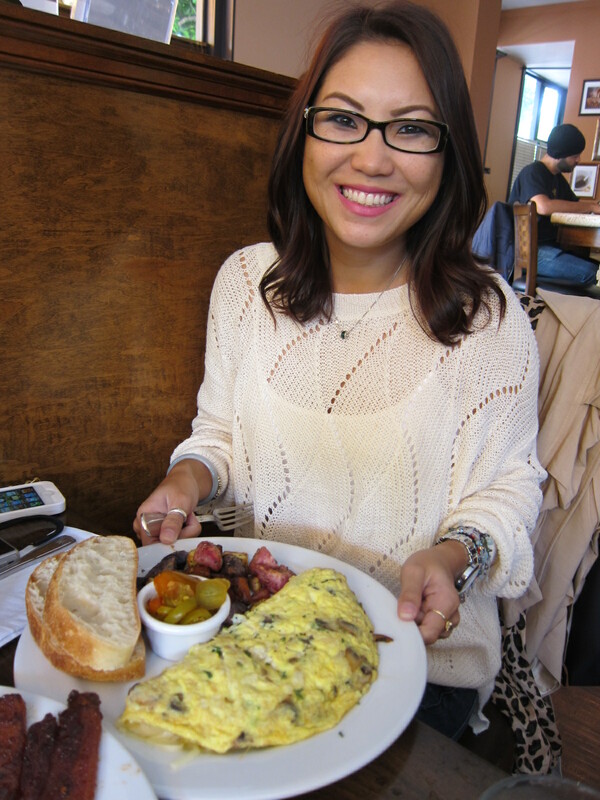 The Fashionably-Forward Foodie: Frisco Trip July 2013 - Beretta and Day 1! I went to college in San Francisco and loved it. The cool air, the fog, the immense amount of things to do in the bustling city, and of course...the shopping. Yep, I loved every second. Never was much of a New York City fan, SF has always had my heart. It is just the right amount of busy and crazy for me! On the other side, there is always time to get away to and relax at Ocean Beach, Golden Gate Park, Mission Dolores or Chrissy Fields. Always. This July, I planned to meet my college BFF, Tara, in SF and go to all of our favorite places. Looking back, I think I did just about everything I wanted to- or the most I could do in just four days! The best part was spending it with friends and family I haven't seen in awhile. Take a look at Day 1 in SF below, and stay tuned for Day 2, 3, and 4 coming soon! In this post, you'll see Young's Fish Market (in Honolulu, before takeoff), Beretta, Sweet Maple, Rickhouse, (a bit of) Commonwealth, and Lolinda! Enjoy! Young's Fish Market- I started the morning off with some Lau Lau, rice and Lomi Salmon before hopping on the plane. Always hot and fresh! I wanted to also take some frozen Lau Lau to my friend that I was staying with in SF to thank him for his hospitality. Thank you, again, ZM! Check Young's Fish Market post HERE! After the longest 5 hour flight of my life (it sure felt like that), I finally landed at SFO. Picked up my luggage and walked outside to feel that chilly air that I missed. Pretty hungry, we decided to go to the Mission and walked right into Beretta with no problem. We were pretty damn lucky to get in without a wait because Beretta was bumpin'! Street parking easy in the Mission when it's around 1045pm too! I looked this place up right before my trip, but was extremely glad I did. Beretta has to be one of my favorite places of the trip. If you love Burrata cheese, you will love Beretta. They practically put Burrata on everything, plus their drinks are top notch. I highly recommend this place. Dark and dim, it is very much a great date spot, but also great to get a drink with friends after work or much later. Open til 1am. Everything we ate was delicious, and I wanted to come back one more time before I left, but I guess that will have to wait til next time. As for highly recommended, get the Walnut Bread with Burrata, and Mushroom-Truffle Honey. A delicious, elegant mix of nutty, sweet and rich. I wanted to get a second order! For our entreé, I was ravenous for some good gourmet pizza, so we ordered the Margherita Burrata. Essentially a Margherita pizza with Burrata cheese instead of Mozzarella. This was one of my least faves- good, but lacked flavor against the Walnut Bread. My most favorite dish of all was surprisingly dessert! Sounds strange, but trust me, this is some AMAZING stuff. Panna Gelato with Extra Virgin Olive Oil and Sea Salt. It wasn't to the point where you feel like you're eating Olive Oil; in fact, the oil gave the gelato a really buttery and luscious touch, plus the sea salt was a crunchy addition on top which satisfies the lover of salty and sweet. I also wanted a second order of this. As for next time, I am most definitely trying their Fava Bean and Pecorino Bruschetta and their Eggplant Caponatina with Burrata, which everyone raves about and was also #56 on 7x7's 100 Things You Must Try Before You Die list. PS- I think the theme of this SF trip should definitely be Burrata Cheese. Lonsdale- Gin, Apple, Lemon, Basil, Honey. Our Waiter described it as "very Citrusy"
Walnut Bread with Burrata and Mushroom-Truffle Honey! Death Proof- Green Chartreuse, Gin, Lime, Root Beer- described as "Herbaceous"
Panna Gelato with EVOO and Sea Salt! AHHHH! The next day, I met up with my Aunty and Cousin at Sweet Maple for lunch. I've heard great things about this charming, little place on Fillmore. Some notable things? Millionaire's Bacon, for one, and secondly, Deep Fried French Toast what what!? Yes, I was extremely excited to catch up with family over some delicious breakfast food. The Millionaire's Bacon was everything that it was hyped up to be. It's a thicker-cut bacon dusted with brown sugar, black pepper, cayenne and a little drizzle of maple syrup before going into the oven to bake. No, it's not crispy, but yes, it will knock your socks off. I'm a big crispy bacon fan, guys, but you will not regret trying a piece of this. It's got a little kick, and a little sweetness, and it makes its way into almost every dish on the menu (like my Aunty's salad!). Or you can always sub any meat for the Millionaire's Bacon! I also thought the fresh Raspberry Lemonade was amazingly delicious too. Not too tart, and just the right amount of raspberry. And it's fresh, not artificial raspberry or lemonade. Not to mention, it comes in the cutest Mason jar with a big, bright lemon slice on top. Really invigorating. I didn't think my Crab omelette was anything to write home about, and should have gotten one of their Benedicts (Athenian, Western, Hass, Marguerite, Herbi, Carni, Crab, or Asparagus)...oh well! Next time! I have to say the presentation on all dishes looked delectable and tantalizing. The fresh fruit on each plate was especially sweet. I tried both of my family's food, and everything they had was delightful. Marnier- French Toast dipped in creamy Grand Marnier (citrus) batter and then served sprinkled with powdered sugar and cinnamon. Kai got the complete meal for $4 more. Comes with 2 eggs and chicken-mango or pork-lime sausage! The Big Hip! Deep Fried French Toast. Powdered Sugar sprinkled and cinnamon sprinkled! Crab Omelette- Crab lump meat, garlic butter, scallion, mushroom, Swiss cheese with hot cherry peppers on the side. After lunch and catching up, I did some shopping at Union Square. I hit up my favorites, Zara and Uniqlo, and then headed for Happy Hour! My friend, Ian, introduced me to Rickhouse which was located right off of Union Square on Kearny and Bush Street. A very "manly-man" bar with a wide variety of whiskey and bourbon all displayed on their all-wooden wall. This place fits the name "Brickhouse" more appropriately than Rickhouse with its wood and brick interior. Very old school. It is a smaller place, and it was pretty filled by 4pm. Around 515pm, they open the back area, where there is more seating. While seated, you also have the choice to order some punch bowls for $50! And that's exactly what we did! Before dinner, we were beyond a doubt all liquored up! If you are a fan of whiskey or bourbon, you must have a drink here! Forever Young (mine, of course! haha) and Punsch Drunk Buck (Ian's......of course)- How fitting for both of us! Forever Young- Gin, Lime, Mint, Seasonal Cordial (Lime Peel/Green Tea) and tastes like a strong Mojito! Punsch Drunk Buck- Irish Whiskey, Swedish Punsch, Lemon, Ginger beer, Orange bitters- like juice, but has a faint Whiskey taste. Great Samaritan Punch with Gin, Rosato Vermouth, Grapefruit and Lemon Juice, Honey, Sparkling Wine. Delicious fruity and strong with a slight bubble! Commonwealth- I had made previous reservations at Commonwealth, and was excited to go there. Ian came along to meet my college friend, Jeremy and his husband. Commonwealth has a tasting menu for $75 or $115 with wine pairing, but we all decided to go ala carte. We did not have the most pleasant experience here, food-wise. The service was polite and graceful, especially when we decided to cut our meal short and ask for the check when we still had our entreés coming. To make a long story short, we were very displeased by the small portions accompanied by the very high prices, not to mention, the wine selections were poor. Didn't seem worth it to pay $60 for a mediocre wine. All of what we had below plus wine came out to be $123 without tip........and our tummies were still extremely famished. Unhappy with our first wine, the Sommelier let us try 3 more- a light, medium, and a rich red. Cured Sardines, Fresh and Salted Plum, Flowering Coriander, Romano Bean, Black Rice- $15. Not even one full Sardine! Sea Urchin, Corn and Tapioca Fritter, Coastal Succulents, Cucumber, Tomato Water Granita- $16. The smallest uni tongues ever, and not the freshest. So, what were we to do? Empty stomachs and no reservations on a Thursday night! Reservations on Thursday and Friday nights are nearly impossible if not booked a week or two in advance. Bacon-wrapped Hotdog to quench appetite first?! Thankfully, Jeremy pulled a few strings (he is the Manager of a Hotel downtown! Yeehaw!) and we were able to be seated immediately at Lolinda Steakhouse. And boy, was Lolinda amazing. I highly recommend this place to anyone visiting the city. First, I suggest you start off with 50/50 Martini which comes served with a side car. You essentially get 2 drinks for the price of one for $12! Steal! Lolinda is an Argentinian Steakhouse that combines Californian and Latin American flavors. Every dish we ordered came out tender and juicy, joined with the most flavorful sauces and spices that did not overpower. I was most excited about The Hueso Asado ($10) which is Bone Marrow with Crostinis, jicama, and chile de arbol jelly. We got two orders! But then the Pork Belly and Short Rib came out, and I was in awe of the flavors and juiciness. I thought it couldn't get any better than that, but then our Pork Chop was plated. To be honest, it was one of the best things I've tasted. A tantalizing array of flavor bursts plus the most fresh-tasting Chimichurri sauce ever! Not stopping at that, we finished with two desserts. 'Cookies and Milk' and 'Maracuya,' a Passion Fruit Panna Cotta, Macerated Berries, Calamansi Sorbet, and Cookie. The waitress asked us if we wanted to spike our "Milk" in our Cookies and Milk, and I excitedly said YES! Too bad it was spiked with Old Grand-Dad Bourbon- I'm not a Whiskey/Bourbon fan! On the plus side, it was still deliciously-creamy and the cookie (Alfajores) was stuffed with Dulce de Leche! If you are a meat-lover, you will love this deliciously-dark and dreamy Steakhouse. Another great date spot with fall-off-the-bone tender meat and superior drinks, not to forget their Rooftop Bar also. At around midnight, we walked out of Lolinda stuffed to the max and a little boozed up aka very happy campers. Hey, did I mention our whole bill was only $175? Yep, thumbs up. Cheers to great friends and a much, much better dining experience! !